I took my first journalism class last semester — spring of 2013 — signing up for Sarah Pollock’s Journalism II just a couple of days before the start of the semester. While I’d been a consumer of news for a number of years, tuning in in a serious way to the events unfolding in the world, the idea of getting involved in (student) journalism hadn’t been in my mind. I was busy writing fiction and essays! But news writing, along with creative and academic writing, involves curiosity and is built of language — and I love the word. 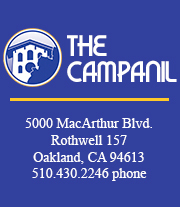 I joined The Campanil as a copy editor and soon became enmeshed in the work of producing news for the Mills community, a task that presents many challenges and some rewards. By the end of the semester I had become managing editor, and this fall expanded my work with our small staff of passionate, dynamic and supportive women. The role was not one I had envisioned when I transferred into Mills as a sophomore, but has been one of the most meaningful experiences I’ve had — not just in college but in life. Involving myself in unexpected areas and pushing through doubt and discomfort, I have learned to trust my voice, both in being part of a team and in being a writer and editor. When I blow off my instinct I find I almost always regret it. In the newsroom we have in-depth and lively debates on issues that arise in the campus consciousness, slam onto the world stage, and come into play in the realm of journalism. Conversations about gender and the identity of Mills as a women’s college have been huge this year, as has the shifting balance between online and paper content. Maintaining a positive relationship with our readers is also a continual challenge as we work to cover topics of interest with a keen eye and journalistic integrity. Sometimes we make rookie blunders; occasionally a source will misunderstand our rights as journalists. But I have noticed that our most exacting critics seem often to be our most ardent and supportive readers, and the work of reporting the news — keeping our ears and eyes out for stories, considering the stakeholders, seeking multiple points of view, providing context and useful information, striving to write with clarity and vibrancy — is both essential to democracy, and fun as hell. All we can do is try our best, and the collaborative nature of this business demands that we show up not only for ourselves but also for one another. We look thoroughly at one another’s work, help each other to improve it, and hold to our ideals. And even though I wasn’t able to launch all of the projects I had originally envisioned (a “how to be an ally” advice column; a school-wide comprehensive calendar), we still achieved work that I am proud of. The laughter and solidarity that regularly fill The Campanil’s newsroom is one reward of throwing your time and effort into a team. The satisfaction and respect that comes from knowing that you tried, that you pushed to your fullest capacity, is even better. Chorel R. Centers is graduating with a BA in Creative Writing. She will be dearly missed!